How to transfer files in Goolge Drive to OneDrive quickly? The answer is with the help of MultCloud, you can do this without using any bandwidth. More and more internet users are using cloud storage service (or online backup service) today. Cloud drive can be useful to you in several ways. For example, it can save the disk space on your PC if you store your data online. Also, it can be used as a backup service so that your files are all safe in the cloud even if your computer hard drive broken. More luckier is, today cloud service has become increasingly popular because of their cross-platform support. It means that you can upload your documents from your PC to the cloud and can instantly access it via your mobile. When choose cloud storage services, I look for features and price: Dropbox, Google Drive, Amazon S3, OneDrive, SugarSync, etc. It seems to me Google was winning before. But now, OneDrive (formerly SkyDrive), has picked up a few substantial updates in recent memory, you can access all the files on your PC from another computer using OneDrive website. Especially today, OneDrive is integrated to Microsoft Office Online (and now with Windows 8 as well) you can view your documents (Word, Excel, PDF, etc.) online without downloading them to your PC. 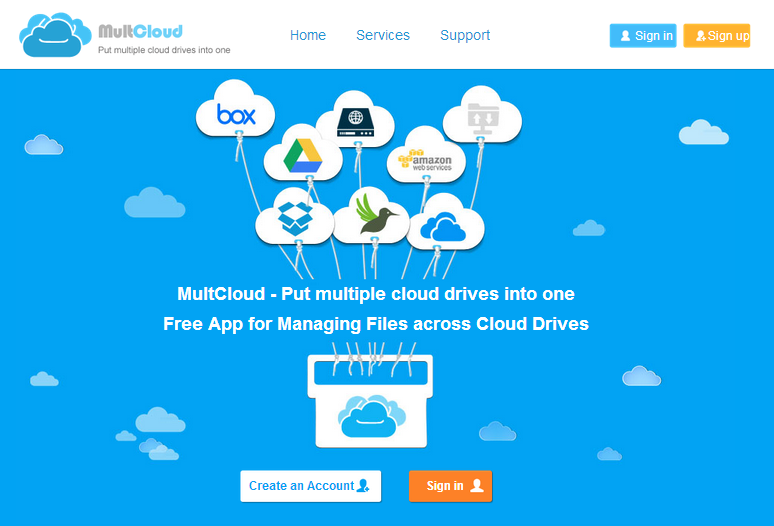 Supported by MultCloud clouds are: Dropbox, Box, Amazon S3, Amazon Cloud Drive, SugarSync, Alfresco, Hubic, Evernote, MEGA, CloudMe, Cubby, MyDrive, WEB.DE, Yande, HiDrive, MySQL, Flickr, MediaFire, ownCloud, ADrive, BaiDu, WebDav and FTP/SFTP. MultCloud is free to use without any limitation of bandwidth. As a multi-cloud management application, all the above mentioned cloud services are supported by MultCloud, including sync and backup data across Clouds. To get started with MultCloud, you must create an account of MultCloud and activate it in your registered email. Once you have logged in it, the first page is asking you to add your first cloud drive. Select OneDrive from the panel and grant MultCloud permission over your account. Because the authorization system of MultCloud is based on OAuth, which is a standard authorization framework that enables third party applications to access multiple cloud accounts without username and password required. It is safe to use MultCloud. After you have added OneDrive and Google Drive in MultCloud, you will see all the files in them from the MultCloud’s interface. You can manage files using the MultCloud dashboard. To transfer all Google Drive’s files to OneDrive, put a check against all the folders you would like to move to OneDrive and drag them to OneDrive. Having done that, all you need to do is sit back and wait. MultCloud will copy all the files from Google Drive to OneDrive without wasting your bandwidth and you can continue with your work. There will be also a progress box at the bottom of MultCloud’s window to show you the progress. MultCloud claims to neither store your login credentials nor the files you worked on. All the transfers are done with 256-bit encryption. MultCloud is a really a hassle-free way to help you transfer, sync and backup the files from one service to another.